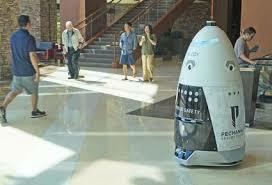 Game Protection Robots Cruising Casino Floors...Are They Coming Soon? Can "Buddy" catch casino cheats? This brings an interesting question. These robots (for now) are more of a security apparatus than a game protection one...but will we ever see robots patrolling the actual casino floor looking to spot cheats, advantage players and even scams in progress? Honestly, I don't know. The first thing that comes to my mind is: even if these robots were equipped with enough cameras and artificial intelligence to perform such a vital game-protection task, would they be able to walk themselves around a casino floor without getting in everyone's way? I mean, picture a crowded Vegas casino on New Year's Eve, which happens to be the annual preferred working-night of professional casino-cheating teams. Forget about the angst those professional casino cheats would feel at the sight of robotical armies honing in on their scams and then one of them rolling right up to their roulette table and in a metallic-pitched robotical voice saying, "You guys are caught cheating"!...what about the regular players only wanting to grab a seat at a slot machine or blackjack table who might be bumping into these strolling robots? Sure, it might be fun greeting and taking selfies with a robot or two in the middle of the casino as long as it doesn't interfere with the gambling. So just the mechanical driveability of the robots might pose a difficult problem to solve. But beyond that, would digitally-equipped-video robots on the casino floor actually help casino surveillance departments identify cheats and spot their scams going down? I must say it would be possible. Although I have never been a big believer in the usefulness of facial recognition technology in casinos, if it were directly put to use right on the casino floor, I might be convinced otherwise, especially if the robots zeroed into a face of a suspected casino cheat and zoomed in, then compared the contours of the face with an existing casino-cheat data base. In that scenario the robots could help. But what about detecting a scam going down without any facial-recognition leads to the cheats being there, or more specifically, being at a table in set-up or operation of their cheat moves? That remains to be seen. Of course these robots could be programmed to recognize tells of professional and sophisticated casino-cheat teams, but wouldn't a skilled human being with knowledge in those tells have to do the programming? Of course he or she would. And that's where these robots, named "Buddy" at the Pechanga, might fall short...though by no fault of their own!